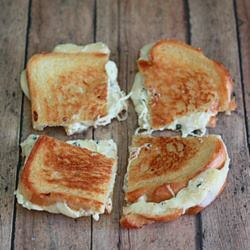 Lay down the bread slices and, using a butter knife, spread the ricotta mixture evenly on each piece. The ricotta mixture should coat the insides of both pieces of bread. )Note: If you’re using large pieces of bread, you may want to make more of the ricotta mixture, or only make two or three sandwiches instead of four).